This salad is perfect on its own or cuddled up next to some lamb chops fresh off the bbq or any other meat you love. ¼ small red onion, sliced thinly and soaked in water for 10 minutes and drained. Spread walnuts on a baking sheet and place in oven for 6 minutes. Stir around and roast for another 3-4 minutes ensuring they don't overcook. Let cool. 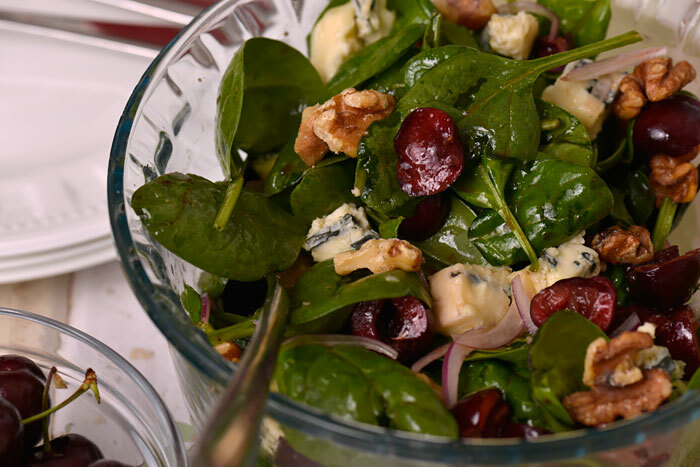 Combine the spinach, onion and cherries n a large bowl and toss to combine. Combine all ingredients and whisk to combine. Taste and add salt and pepper until it's to your liking.